Preliminary Chart of Eastern Entrance to Santa Barbara Channel Claifornia. 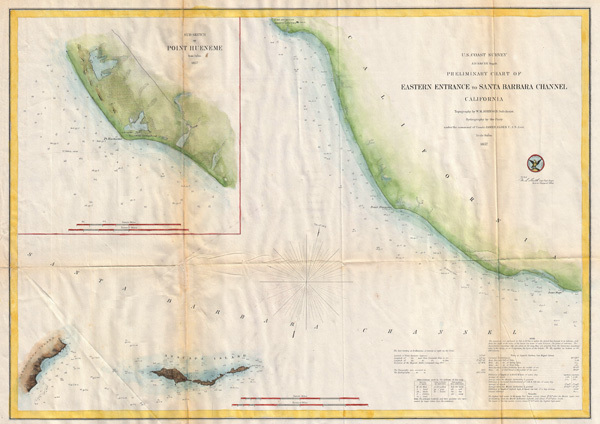 An extremely attractive hand colored 1857 U.S. Coast Survey chart or map of the Eastern Entrance to Santa Barbara Channel. Depicts the California coast from the Town and Mission of San Buenaventura (Ventura, CA) to Point Mugu. Includes Santa Cruz Island and Anacapa Island. An inset map in the upper left quadrant details Point Hueneme (Port Hueneme) and its vicinity. The entire map offers numerous depth soundings. Detailed information on Tides and Sailing instructions in the lower right quadrant. The topography for the map was prepared by W.M. Johnson. The hydrography was accomplished by a party under the command of James Alden. Compiled under the direction of A. D. Bache, Superintendent of the Survey of the Coast of the United States and one of the most influential American cartographers of the 19th century. Very good condition. Original folds exhibit wear and light toning.